Looking for a prepaid credit card that offers a bit more than its competitors? It just might be the Univision MasterCard Card is what you’re looking for. Loaded with benefits, this is a perfect solution for many. 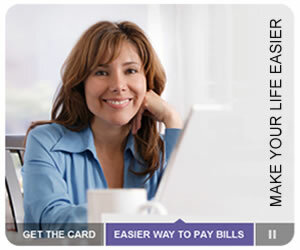 If it’s a low cost and low maintenance prepaid card you’ve been waiting on, it’s arrived. Card holders enjoy free transactions, free direct deposit, free bill pay, free text alerts and online account access, free ATM withdrawals if you select any of the 35,000-plus in-network ATMs (all Target retail stores and most all 7-11 convenience stores are just two places where you’ll always enjoy free ATM withdrawals) and up to two free additional MasterCards so you can ensure your family members always have access to cash. Need more than two? Add more for just $9.95. Choosing a prepaid credit card allows you to travel safer because you’re not carrying cash. If your card is ever lost or stolen, your money is safe. Your PIN number protects you even further and the Univision Prepaid MasterCard is FDIC protected. You don’t need a checking or savings account, either. With the Univision Prepaid card, you can also easily add cash at thousands of grocery stories, convenience stores, drug stores and anywhere MoneyGram or WesternUnion is located. Make purchases anywhere MasterCard is accepted, including traditional storefronts and online. You’re always in control. And you can place up to $9,000 USD on this MasterCard. The Univision Prepaid MasterCard requires no credit check and you’re not even required to submit a social security number. That’s a big bonus for many folks. All you need to receive your own Univision card is your home address, your date of birth, your phone number, email address and a form of ID such as a Matricula Consular, a driver’s license or passport. There is an optional Spanish application form and there’s even a Refer a Friend program that allows you to earn money each time someone uses your referral code. You’ll receive $10 on your Univision Prepaid MasterCard and your friend will receive $5 on his whenever one of your friends becomes a Univision Prepaid MasterCard carrier. The twenty four hour, seven day a week customer support is designed specifically for the Hispanic community. Alerts, the website and disclosures are provided in Spanish and your phone calls are always answered by a customer service representive who is fluent in both Spanish and English. Anytime you use the Allpoint Network ATMs – and there are at least 30,000 in the U.S. alone – you’ll enjoy fee-free cash withdrawals. As mentioned, every Target store is included in the network and most 7-Eleven stores are too. If you use an out of network ATM, your fee is $1.95, plus any other charge the home network charges. You receive all of those great free benefits outlined above, including 24 hour a day, 7 day a week customer service and free ATM withdrawals when you choose an in-network for just $9.95 a month. There are no activation fees, no interest and no overdraft fees. No hidden fees at all – so you rest easy knowing you’ve made a solid financial decision. Card replacement, check refunds or express shipping are just $9.95 per transaction and if you travel internationally, your conversion fee is just 2% of any transaction. More information on these optional fees can be found here. As you can see the Univision Prepaid MasterCard is a great choice. With many card benefits, an easy to enroll process, a flat monthly fee that’s predictable and affordable – what more could you want in a prepaid credit card? You’re in control – and when it comes to our finances, that’s the only way it should be. Review the terms and conditions and apply Univision Prepaid MasterCard here.